Whenever I think of James Gandolfini, I am always reminded of my late father and how obsessed he was with The Soprano’s. He told me about the show during one of our many awkward conversations in which we attempted to find some sort of neutral topic to discuss. We both loved gangster movies and he knew that I loved Nancy Marchand who played Livia Soprano on the show. He raved about the ensemble cast and how brilliant the lead actor was. I listen with half an ear. I didn’t have HBO at the time and had no plans to get it. I’d seen every wiseguy movie ever made and I though the genre had been explored to death. About a year later Mike, a co-worker at the collection agency where I was working, mentioned the show to me. It was unusual for him to talk to me at all as he was a rough neck collector who never read, went out drinking every night and rarely watched anything but sports. We had nothing in common, but for some reason he felt compelled to discuss this show with me. The next day he brought me a video tape with the first four episodes of the show on it; I was instantly hooked. Every episode of The Sopranos was like an independent film from the lighting, to the music, to its subtle use of metaphor. All of the major actors were New York stage veterans who brought years of training and craft to their performances. The show had a brilliant premise; a mob boss suffering from anxiety must find a way to balance his time and attention between his family and The Family. After I started watching the show, my father and I were never at a loss for conversation. We discussed Tony as if he were a member of our family. We’d always make fun of the way Carmella followed every new age spiritual trend and sold out at the drop of a dime; she reminded us of my aunt. We loved the way Dr. Melfi, for all her training and education, couldn’t see what a simpleton monster Tony was. We talked about how “the “progress” Tony was making was all in her head. I had been in therapy as a child. My father and I never mentioned our own experiences with child psychiatrists, but it was the closest we’d ever come to discussing it. My dad laughed when I told him that inside Tony secretly wanted to be a vegetarian. I couldn’t help but notice that animals represented innocents to Tony. From the birds that flew away from his pool in the very first episode, to the horse that got whacked by the loathed Ralphie, to the dead animal his mother seemed so thrilled to cook, animals always seemed to represent something Tony was losing and couldn’t get back. I was thrilled when Aida Turturro joined the cast as Tony’s, sister. She gave me a little glimmer of hope that someone out there, albeit not me, had broken though the good looks glass ceiling. She created a complex and maddening character as Janis. We agreed the best thing about the show was the unique humanity of its lead actor James Gandolfini. My father thought James Gandolfini was another Brando because of his virility, but his technique made me think of Jimmy Stewart in the way that he could convey everything his character was thinking whether it was love, hate fear or shame or lust, in his eyes. Galdolfini built layers of character in Tony Soprano. Every mannerism, every movement was consistent from week to week. We knew Tony as well as we knew anyone in real life. His humanity was what made Tony so empathetic to people from all walks of life. Who hasn’t been angry enough to kill somebody who has humiliated him or her? Who hasn’t started a diet at breakfast and ended it at lunch? Who isn’t afraid of some kind of retribution weather it’s God or Karma or an angry dead mistress. In 2002, right after season four ended, my father was diagnosed with terminal cancer; he had six months to live. The show went on a long hiatus and we never discussed it again – neither of us wanted to mention that he probably wouldn’t live to see the next season. Our conversations went back to being awkward and stilted. He tried to pretend like nothing was wrong and I pretended to buy it. He died in 2003 and I was left alone with Tony. Even though it was never quit the same after that, I couldn’t help but wonder what he would have thought of Christopher’s drug addiction, Adrianna’s squealing and subsequent whacking and of course the fact that the show ended with a ring and not a bang. 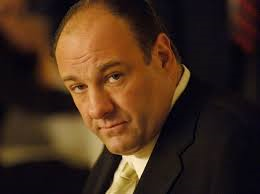 Yesterday, James Gandolfini died of a heart attack at the age of 51. I was sad at first, but then I thought of my father; maybe they would meet somewhere in the great beyond. My father never was not very cool around famous people, he giggled like a little school girl when we attended a cocktail party that also contained Studs Terkel and he stared and whispered when a local newscaster ate lunch at the same cafe we did. I imagine that he is chasing James up and down the stairs of the afterworld asking what really happened to the Russian that ran away in the woods. So, James and dad if you are up there together and your reading this (which you aren’t; no one reads Elizashead, not even ghosts who have nothing to do for the rest of eternity). I miss you both. And if the food is as good as I I’ve been told it is, will you save a slice of eggplant parm for me?